Dasher Technologies continues to build partnerships in order to provide the best solutions possible to our clients. Take a look at our newest partnerships in Storage, Archive and Backup. Backup is an obvious first place for companies to adopt the cloud. 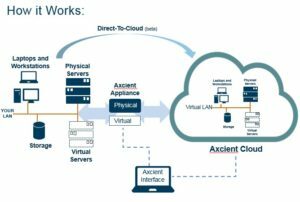 Axcient, a backup and recovery-as-a-service vendor, offers local and offsite protection for data and applications with customizable protection schedules controlled from a single web-based console. Axcient provides an on-site copy of the most recent data and sends a copy to the cloud for long-term retention. A business can also run virtual machines for a few weeks in their onsite hardware and their cloud while you get your primary environment back online. 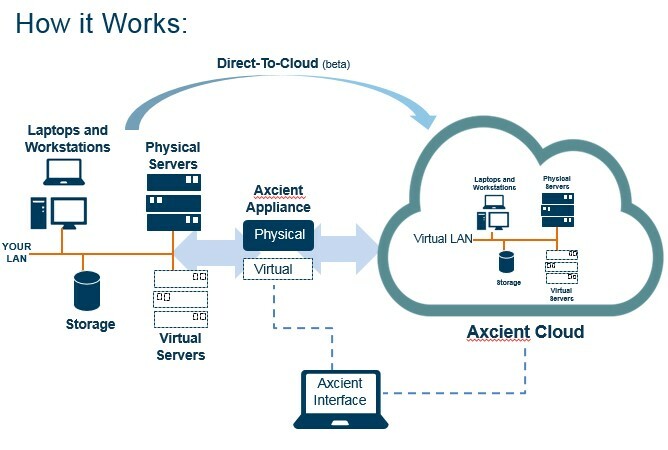 Axcient has a mature business model and a mature technology. 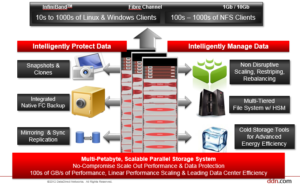 CleverSafe is the first option for PB scale object based storage we will discuss in this blog. It uses erasure coding to lower the overall cost of storage for Tier 2 and Tier 3 environments. This solution is ideal for medium to massive scale deployments, which look to eliminate the challenges of storage at petabyte-scale and beyond. CleverSafe has partnered with many hardware manufacturers to provide reference architectures. 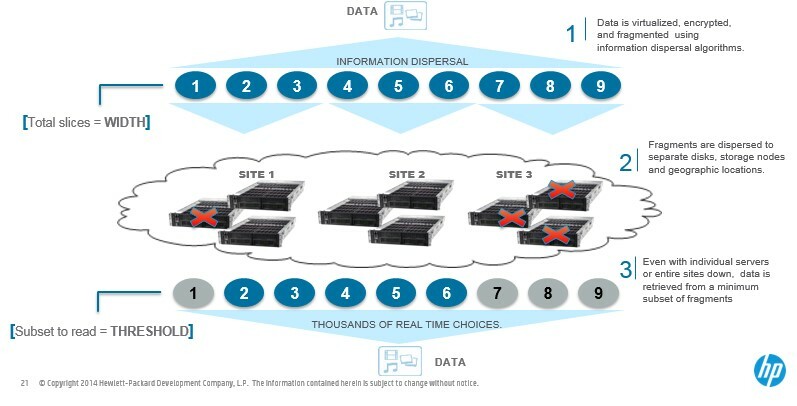 Below is a slide from HP discussing how CleverSafe utilizes Erasure coding to protect data. Cloudian is available as both software or an appliance. 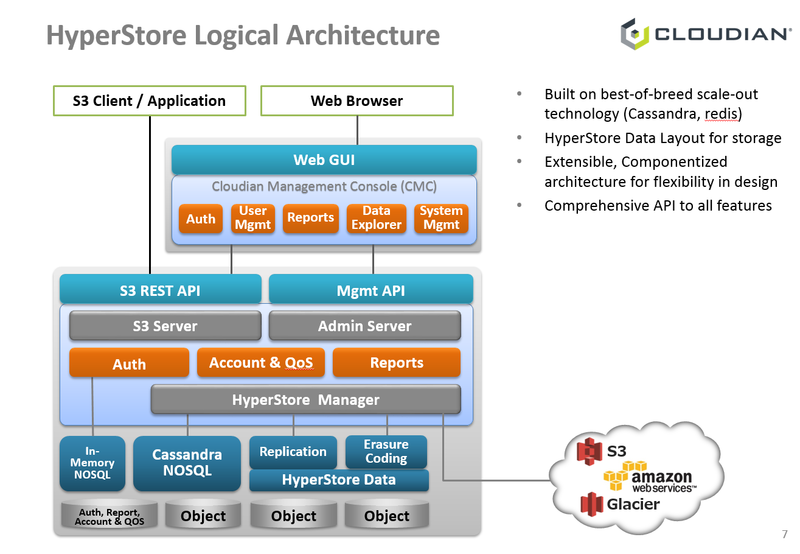 Cloudian incorporates a complete S3 compatible API that companies can use to create a private cloud version of Amazon’s S3 at a much lower cost. 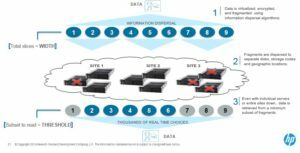 One really cool and useful feature of the Cloudian solution is that it supports both data protection methodologies in use today for Tier 2 and Tier 3 data. It uses replication for smaller items where erasure coding would be wasteful and in turn uses erasure coding for larger objects. The protection methodologies are user configurable. 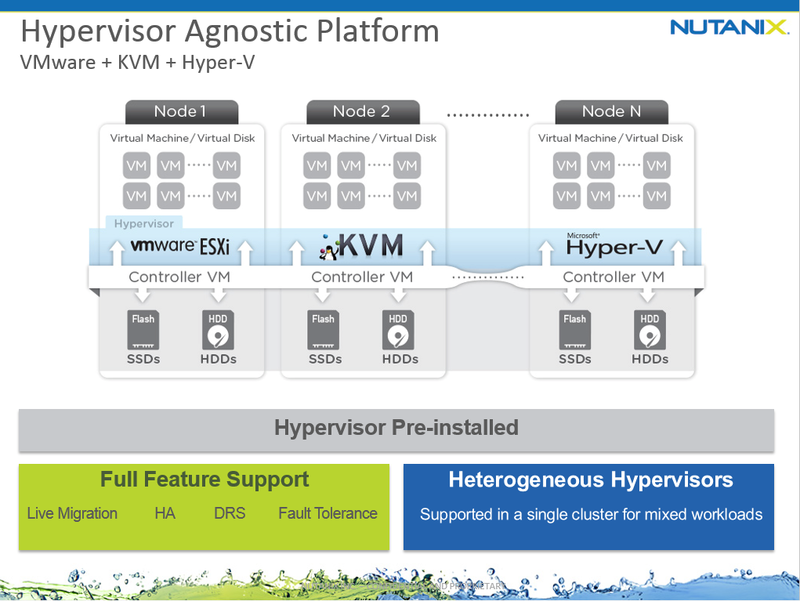 The other differentiation is that it can burst into the cloud for a true Hybrid storage solution. DataDirect Networks (DDN) provides high performance storage solutions with robust analytic features based on block storage and supporting GPFS (GridScaler), Lustre (EXAScaler) parallel file systems and standard NAS file serving. DDN provides a complete Object Storage WOS solution as well, all supporting a RESTful API. Dasher has seen DDN tackle high performance storage problems that tie together single and parallel file systems, and block object based offerings under one platform. Dasher has been providing DDN solutions for years, but we have seen a renewed interest in the solution due to company needs for more high performing storage solutions- we are big fans! HGST’s Active Archive has an array of features including 2.9PB (usable) storage per rack, 3.5GB/s throughput per rack all within a ~6.5kVA power envelope. The HGST Active Archive adds high availability with the use of erasure coding, allowing the device to withstand up to five hard drive failures and even shelf failures when designed at scale. 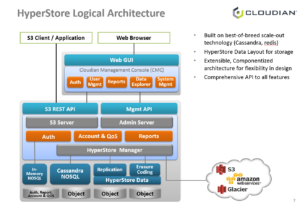 The technology has an object-based interface that supports Amazon S3 Object API and NFS/SMB through a high performance gateway. In 2014, the industry saw the rapid adoption of SSD’s to address the need for high IOP and low latency applications, like databases. In 2015 and beyond, we continue to see growth, however we also predict a huge expansion in large petabyte scale-out storage environments. HGST has a winning solution based on their own Helium filled hard drives– really cool stuff! 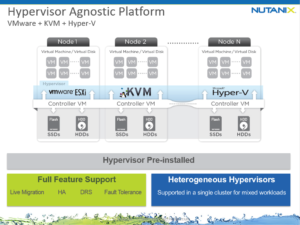 Nutanix has led the way in Hyper-Converged data center solutions. Nutanix collapses compute and storage into a single tier, eliminating the storage network, and achieving massive scale with highly-distributed software, all built with commodity hardware. If you run VMWare you should probably be running PernixData. PernixData is a software product that accelerates both read- and write-intensive applications on the server side. 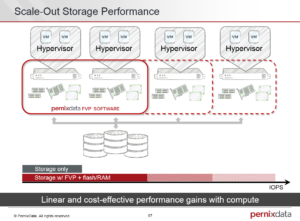 PernixData allows you to defer adding more expensive storage in your SAN by catching reads/writes in local SSD or PCI Flash on the servers in your VMWare Cluster. It provides a shared layer of acceleration as seen in the image below. Scality is one of the new breed of software defined storage solutions tackling the petabyte scale object based arena. Think 500TB and above! Scality is a true software scale-out solution, so it is NOT based on the old 2-controller, multi-disk shelf concept. It is built on large servers with direct attached storage that are tied together in the Scality RING. 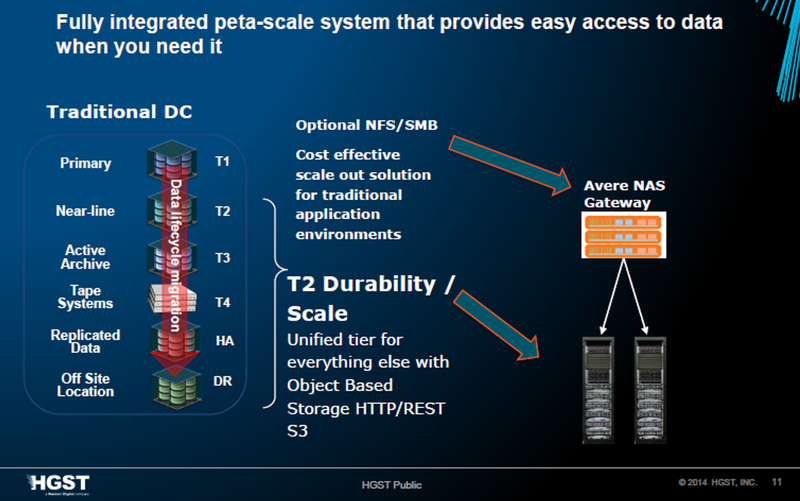 Scality targets Tier 2 and Tier 3 storage, like the HGST Active Archive.